Ride off the track and onto your motorcycle lift stand with the new and improved patented design Risk Racing RR1 Ride-On Motorcycle Lift Stand. There will be no more grunting, or trying to kick a motorcycle lift under your bike. Simply push or ride the bike onto the lowered RR1 Ride-On Motorcycle Lift Stand; as the front tire touches the front plate, the lift goes into action rising to the bottom of the motorcycle frame. Step on the foot pedal and your bike will rise effortlessly into a secure position. Getting your bike down is just as effortless and simple, making the Risk Racing RR1 Ride-On Motorcycle Lift Stand the most innovative motocross lift stand on the market. Never heave your bike onto a glorified stool again. 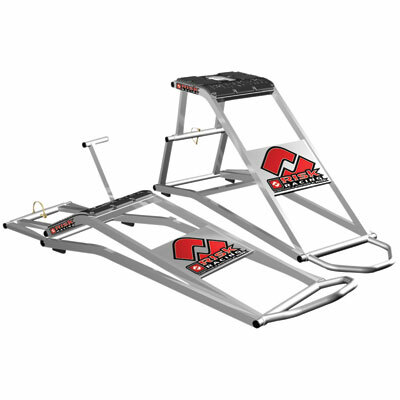 Ride off the track and directly onto the lift stand. Sturdy construction and powder coat finish. Large, durable rubber mat on top to grip the bike. Lockable in the up or down position. Works with Motocross specific bikes 125cc – 450cc.